Performed by students, faculty, staff, alumni, and friends of Penn State Brandywine in celebration of the campus' 40th anniversary in 2007-2008. On Monday, March 31, Marilyn Cohen, COO and Director of Education from the National Liberty Museum, came to campus and presented a seminar on "The Power of One." Her seminar was filled with examples on how one person, from Nelson Mandela to Sharon Katz and her Peace Train, can spark a movement and make a difference in the lives of others. The students in attendance were literally moved to tears, listening and reflecting upon the content of the presentation. On March 13, 2008, the Penn State Brandywine campus was honored to welcome guest speaker Margaret Akullo Elem. Ms. Elem is the Chairperson of the Lango Female Clan Leaders' Association, The Greater North Women's Voices for Peace Network, and Campaign Against Domestic Violence in Community (Cadovic). She fights for women's rights at all levels of society, specifically in northern Uganda. She detailed the grassroots movement she initiated, using mass media (specifically radio) to educate women about their rights and ways to access justice. The grand idea to fill a Gulfport, Miss., camp with philanthropic-minded Penn State students and staff will become reality as 70 students, faculty and staff from five Penn State campuses descend upon Orange Grove Volunteer Village on March 9-14. This year, an alternative spring break program became a University-wide opportunity to support Katrina Relief and to help residents clean up and rebuild. A group of PSU Brandywine students are spending spring break in Santiago, a Mayan village on Lake Atitlan in the highlands of Guatemala. This year the students will be leading reading activities in the new children's library and working in a rural pre-school. They also anticipate planting trees in an area where mudslides caused much damage and death during Hurricane Stan in Fall 2005 In addition, they are possibly participating in a garbage processing project and in a research project which is studying causes of and remedies for lake contamination. 34) Campus coupon cutters at it again! The challenge - to cut/sort/add $4,000 worth of coupons in four hours to send to our adopted military base, the U.S. Navy's Yokohama base in Japan. We certainly have quick and efficient cutters on campus! Thanks to the donations of coupons from the campus and our friends at Granite Farms Estates, we cut and collected $8,176.78 worth of coupons! These coupons will certainly make a difference in the lives of our military members and their families. 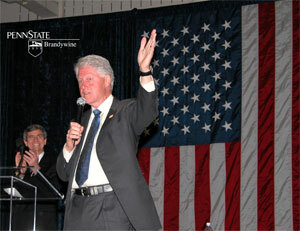 On March 7, 2008, Penn State Brandywine experienced a true act of civic engagement. Former President Bill Clinton visited the campus to speak on behalf of Hillary Clinton as she seeks the Democratic nomination for President. President Clinton addressed such topics as energy sources (wind and solar), health care, No Child Left Behind, student loans, and why we need to be prepared to work and exist in a global community. Congressman Joe Sestak (in photo below with the President) provided the introduction before the 45-minute speech. Clinton's visit was an outstanding way for the campus to participate in this exciting election year. Thank you to the Student Government Association for inviting the candidates to campus! Ann Karlen, from White Dog Community Enterprises, was our second invited speaker for the Clarence D. Bell Public Service Lecture Series on March 3, 2008. Ms. Karlen is the founding director of Fair Food, where the mission is to make connections between Philadelphia chefs and farmers in southeast Pennsylvania. She also spoke extensively about the Farm to Institution initiative. A Welcome to the 40 Acts!